Grill master Steven Raichlen shares more than 60 foolproof, mouthwatering recipes for preparing the tastiest, most versatile, and most beloved cut of meat in the world—outside on the grill, as well as in the kitchen. Take brisket to the next level: ’Cue it, grill it, smoke it, braise it, cure it, boil it—even bake it into chocolate chip cookies. Texas barbecued brisket is just the beginning: There’s also Jamaican Jerk Brisket and Korean Grilled Brisket to savor. Old School Pastrami and Kung Pao Pastrami, a perfect Passover Brisket with Dried Fruits and Sweet Wine, even ground brisket—Jakes Double Brisket Cheeseburgers. In dozens of unbeatable tips, Raichlen shows you just how to handle, prep, and store your meat for maximum tenderness and flavor. Plus plenty more recipes that are pure comfort food, perfect for using up leftovers: Brisket Hash, Brisket Baked Beans, Bacon-Grilled Brisket Bites—or for real mind-blowing pleasure, Kettle Corn with Burnt Ends. And side dishes that are the perfect brisket accents, including slaws, salads, and sauces. 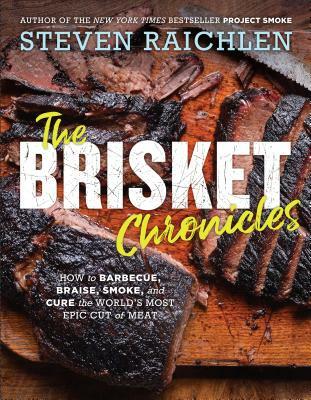 Steven Raichlen is the author of the New York Times bestselling Barbecue! Bible® cookbook series, which includes the new Project Fire, Barbecue Sauces, Rubs, and Marinades; Project Smoke; The Barbecue Bible; and How to Grill. Winners of 5 James Beard awards and 3 IACP awards, his books have been translated into 17 languages. His TV shows include the public television series Steven Raichlen’s Project Smoke (currently in its 3rd season); Primal Grill; and Barbecue University, and the French language series Les Incontournables du BBQ and Le Maitre du Grill. Raichlen has written for the New York Times, Esquire, and all the food magazines; he teaches sold-out Barbecue University classes at the Broadmoor in Colorado Springs. In 2015, he was inducted into the Barbecue Hall of Fame. His website is www.barbecuebible.com.